Just three months ago, we first unveiled the Power BI Preview, and since then, we’ve been continually releasing new features and improvements, from content packs for Microsoft Dynamics Marketing and Google Analytics, to support for treemaps on dashboards, to a slew of enhancements in the Power BI Designer Preview. Now, we’re sporting a fresh new look – one that’s modern and distinctive while keeping your focus on what matters: your data and your insights. 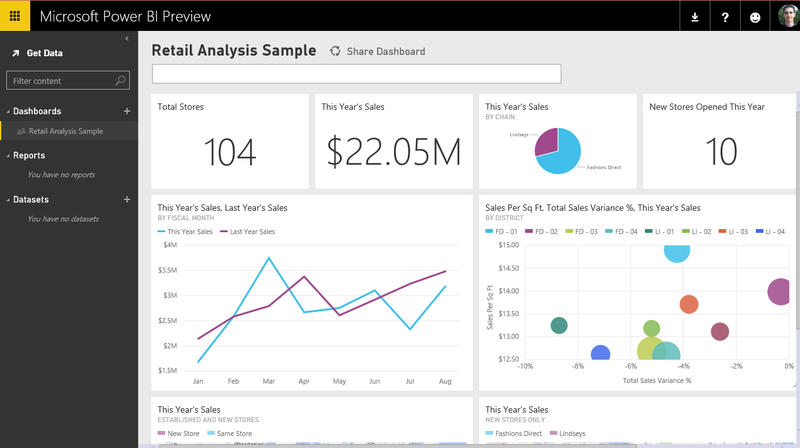 With Power BI, you can connect to all your data, monitor what matters on personalized dashboards, and answer business questions with interactive reports and natural language.